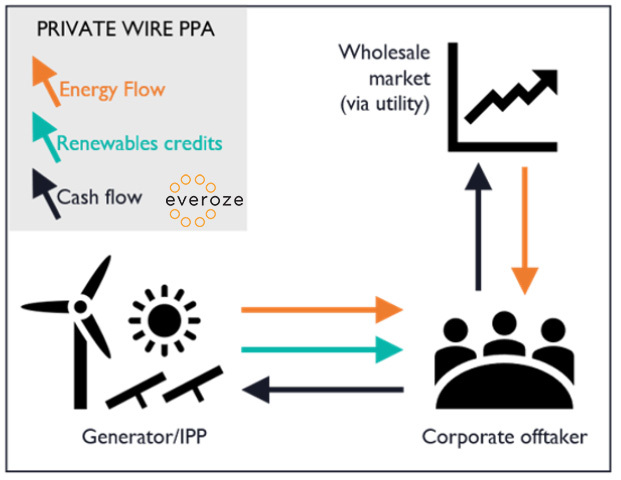 Corporate PPAs offer a rare source of revenue certainty in an era of subsidy-free renewables: there are three models you need to know about. ‘Subsidy-free’ can be a euphemism for ‘no stable revenue stream’ with projects exposed to the wholesale energy price. The fact is, pension funds and other traditional institutional investors do not generally have an appetite for market price volatility risk, particularly for new build projects. Corporate and Institutional (C&I) Power Purchase Agreements, more commonly known as Corporate PPAs, offer one way to reduce this risk: locking in a stable, long-term revenue stream to give comfort to institutional investors. Corporate consumers are increasingly looking to reduce their environmental footprint and energy costs. The RE100 collaborative is just one example of this – a global initiative of more than 100 influential businesses committed to 100% renewable electricity, and working to massively increase demand for, and delivery of, renewable energy. The volume of C&I PPAs contracted in 2017  was about 5.4 GW globally, with over 1 GW of capacity contracted in Europe alone. C&I PPAs show a strong potential for growth in Europe. To unlock this potential, C&I PPAs need to be perceived by corporate consumers as a sensible way to procure energy and manage their price risk. Besides providing much-coveted green credentials, in recent years renewable generation is seen as a competitive alternative for consumers. For example, in the UK, developers are increasingly confident of successfully delivering onshore wind projects at an energy price of about £50/MWh (€57/MWh). Comparing this against the wholesale energy price of £45/MWh (€51/MWh) for 2017 (N2EX day-ahead), and taking into account supplier margins on top of this, consumers such as the RE100 companies do not have to pay a large premium to bolster their renewable credentials and deliver ‘additionality’ to satisfy their sustainability commitments. “All that’s fine, but what are C&I PPAs and how are they different from traditional utility PPAs?”, you may ask. Well, this is a perfectly reasonable question as C&I PPAs are not yet commonplace in Europe compared to the US where the market is more mature with a variety of PPA instruments and structures available. We at Everoze will answer this question and explore this topic further in a series of blog posts which will follow this initial primer. In our view, the C&I PPA is neither a subsidy-free panacea nor is it the white whale that some analysts suggest. Having worked on C&I PPAs both based in the US and in UK as part of project finance and M&A transactions, what I have come to acknowledge is that there is no off-the-shelf C&I PPA solution and each transaction requires a bespoke approach, shaped by the motivating drivers, knowledge and risk appetite of the corporate offtaker and the investors. There are certainly challenges in negotiating these agreements and making them bankable, but equally there are lessons learnt from mature C&I PPA markets such as the US which are useful for emerging European markets. But know this – the opportunity is real with tech giants Google and Apple signing-up to C&I PPA across Europe. To kick things off and get your cogs turning, below is a quick snapshot of the types of C&I PPA structures typically seen, along with the things about them that make us smile (and frown). The IPP delivers energy directly to the Corporate Offtaker via the consumer’s site network and so there is no use of the distribution or transmission system for delivery of energy to the end user. This is in essence a behind-the-meter power purchase agreement. A commercial agreement between the parties provides the price security for both parties. The Corporate Offtaker can avoid non-energy and network charges on the energy consumed from the IPP, compared to the energy supplied by an energy supplier. The generation site is physically close to the end user to minimise connection costs, and so availability of good sites for renewable generation may be restricted. Reliance on the customer’s site network and grid connection, and where applicable, sited on the customer’s land, introduce complex legal and commercial considerations. The IPP will need to demonstrate compliance with complex electricity supply licence exemption rules which can be difficult depending on the generator, the customer and structure of the PPA. Energy delivery from the IPP’s site to the corporate offtaker is facilitated by an intermediary such as an electricity supplier via a back-to-back supply arrangement between the corporate offtaker and the supplier. 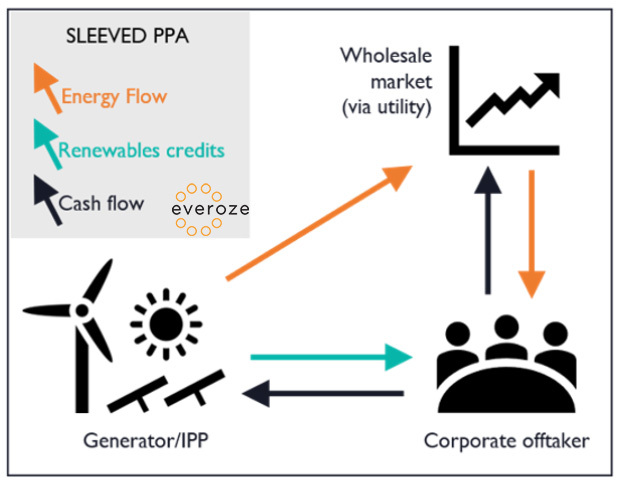 The supplier takes delivery of the energy at the IPP’s site (on-selling) and sleeves it to the corporate offtaker at its point of consumption for a small fee. The supplier also tops-up the electricity delivered to meet the Corporate Offtaker’s energy demands and provides the necessary balancing functions. Sleeved structures are simpler structures compared to synthetic PPAs, but…. …are governed by complex contracting arrangements between the IPP and corporate offtaker. The corporate offtaker is reliant on the energy supplier providing the sleeving serviceon top of the traditional energy supply function, which increases the complexity of the energy supply agreement and reduces the flexibility to change suppliers. Depending on the supply arrangement between the corporate offtaker and the supplier, energy supplied may be restricted to a specific site of the corporate offtaker. The structure does not allow flexibility for multi-buyer models. There is no need to demonstrate regulatory compliance over the ordinary. Synthetic structures are in essence a form of a hedge where the parties buy and sell energy on the wholesale market (either directly or through a supplier as the local regulations may require), with a separate agreement between the parties providing the price security. There is no physical transfer of energy (title to energy) between the parties. 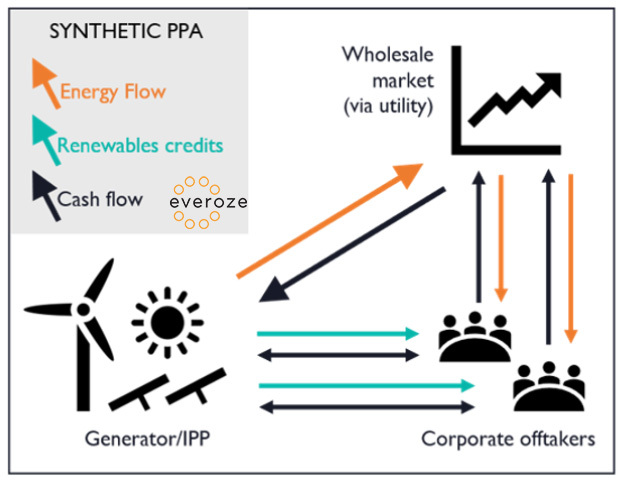 Synthetic PPAs can be structured as a contract-for-difference, (essentially a “swap”) or as an options agreement including put/call options providing a price collar. …are governed by simpler contracting arrangements between the IPP and the corporate offtaker. The structure allows for flexibility in the number and location of loads supplied, and also accommodates a multi-buyer model. Depending on the prevalent financial regulations, synthetic PPAs may require derivative accounting practices. Over to you: what are your burning corporate PPA questions? C&I PPAs offer the potential for corporate consumers to meet their sustainability commitments and renewables developers a bankable route to market in the post-subsidy environment. But this potential can only be realised if all stakeholders get to grips with the associated risks and ensure these are effectively managed during PPA negotiations and the financing process. For my next post, I’m planning to drill into the Top 5 Risks associated with Corporate PPAs, or perhaps present Everoze’s views on the role of storage in Corporate PPAs. But what are your questions? I’m open to suggestions! Please post your questions here.